Aramark is a leader in professional services, providing award-winning food services, facilities management, and uniform and career apparel to health care institutions, universities and school districts, stadiums and arenas, and businesses around the world. In 2009, Aramark Healthcare started using prepaid cards to recognize and reward employees for high performance and exemplary behavior. Managers in their health care facilities present reward cards to staff members in various denominations depending on their level of achievement. When several employees stayed through natural disasters, like flooding and snow storms, to make sure food was prepared for the hospital staff, patients & patients families, their managers presented them with reward cards. These recognitions have helped to increase positive results in the workplace and strengthen the community at Aramark. The HR department at Aramark Healthcare wanted to find a simple and flexible program to help promote extraordinary employees. They decided on prepaid reward cards through OmniCard because of the quick response from the sales team and the time savings to manage this program. Managers ordered the cards through HR either on a case by case basis or in bulk, so they have cards on hand for on the spot recognition. 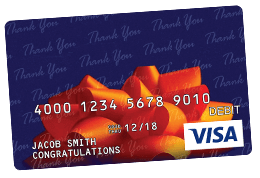 Recipients love the cards because they are easy to use and can be redeemed virtually anywhere.